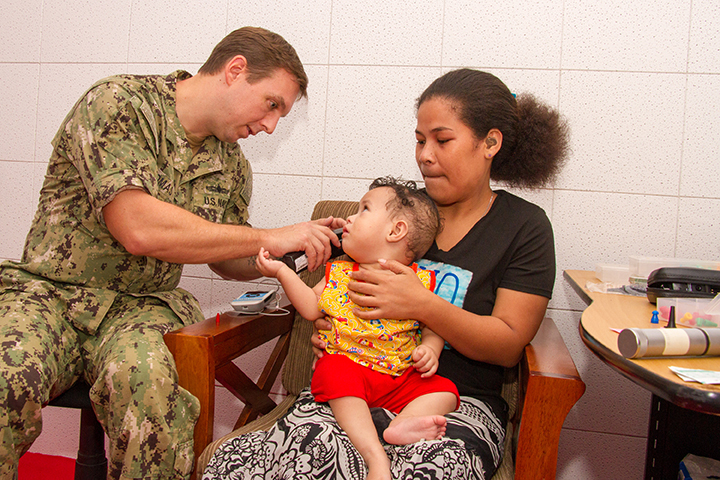 Pohnpei—Four members of the US Navy’s Medical Corps visited Pohnpei this week. While here the members offered different types of services including audiology services on a referral basis. Lt. Matt Thomas, the audiologist on the team said that the hospital had referred several infants for further hearing tests after they had failed their initial testing. He said that it is not at all uncommon for infants to fail their initial hearing test and that parents shouldn’t panic if it happens with their child. He said that if it does happen the parent should wait for a month and have their child re-tested. There are a number of factors that can influence the results of a hearing test. He said that it is not at all uncommon for infants to have fluid in their ears that can produce false results. He also said that some of the testing gear can be influenced by body movement and many babies are in constant motion. Pohnpei does have audiology testing equipment. One of those pieces of testing equipment performs the Auditory Brain Stem Response. Electrodes are placed in the proper locations on a baby’s head. It generates a series of clicks through headphones and measures the electrical response of the brain stem. That machine can be used for extremely advanced testing. However, the electrodes are disposable and Pohnpei has run out. Lt. Thomas said that a team is coming in a month to calibrate the machine and will also resupply the electrodes. Lt. Thomas brought his own testing equipment, one of which conducts an Oto Acoustic Emissions (OAE) test. He said it is the quickest and most reliable test for infants but that each of the testing methods can be influenced by outside factors. Essentially, the small hand held machine sends out a tone and measures the echo it receives back from the ear. Thomas said a healthy ears sends an echo back. They can tell a great deal based on the frequency the ear sends back. Thomas said that he’d been in Chuuk several times to perform tests. We asked him if during his visits he had noticed any tendency for higher numbers of congenital deafness. He said that he had not seen any evidence of that; however, he said that a large number of cases of hearing loss might have been able to have been avoided. “Children get a lot of ear infections,” he said. “It’s important that those infections be treated and that the treatment is followed until cleared by a doctor.” He said that he’s seen several cases where an ear infection destroyed the ear drum of the patient resulting in permanent hearing loss. “It’s vital that patients follow doctor’s instructions for treatment and should not stop until they are cleared by the doctor.” He said that during treatment a patient should not swim and should keep their ears dry in order for the treatments to work. The members of the Navy Medical team included Lt. Commander Eva Reed who is a Senior Global Health Monitoring and Evaluation Adviser. She did consultation with departments of health while she was here. Lt. Junior Grade Christopher Low is an Industrial Hygiene and Occupational Safety Scientist. He had been scheduled to visit several schools in Pohnpei during his visit to test for asbestos and lead paint. Due to the cancellation of classes during the first two days of his visit his visits had to be significantly shortened and scheduled all on one day.